From the Collection: “Howe” did this get here? We have been finding all kinds of objects within our collection while we prepare for the move to the new museum. Unfortunately, the histories behind many of these objects are shrouded in mystery. Many of the materials come from the old Pioneer Museum and do not have very good records. Like many museums, they took in objects, displayed them, and then stored them away without writing about their history for future generations. This can lead to some very frustrated museum staff! James Henry Howe was married to Eva Schuyler. James was known to drink a lot and often took out his aggression on his wife. According to newspapers, on April 3, 1888, James came home and assaulted his wife. Eva called the police, but refused to have him arrested. The next morning, James left the house. Eva dropped their 5-year old daughter Gertie off at a neighbor’s house, then returned home and began packing and making arrangements to leave him. Before she could finish, James returned home. According to a neighbor’s sworn statement, Eva cried out “Murder!” before she fell to her hands and knees through the front door. James then cut her under the left side of her jaw. She got up, cried “Murder!” again before finally collapsing. By this time, other witnesses arrived and a doctor was summoned, but by the time the doctor arrived Eva was dead. 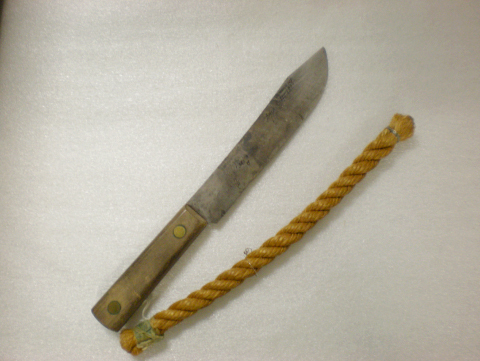 As for the knife and rope that we have…According to the old label, the knife belonged to the Sheriff, but why does it have the date that James Henry Howe was lynched written on it? Other than the fact that Davy was the Sheriff at the time, the knife does not seem to make a lot of sense. It is not the murder weapon (the terrifying thought that first crossed my mind) – the knife James used was a lot smaller. Next I thought perhaps it was the knife that was used to cut James down, but according to the newspapers the coroner was the one to do that. So at this point, it remains an unsolved mystery. As for the rope, the old label said that it belonged to Thomas Pendergast. A Thomas Pendergast was living in Fort Collins at the beginning of the 1900s, so it’s possible he was there at the time of the lynching and kept a piece of the rope as a grisly souvenir. The rope also has a faded blue silk ribbon tied around one end that reads “Reina Victoria.” As it turns out this piece of fabric looks like ribbon that once was used to tie cigars together, and cigar ribbons like these date to around the same time period as the lynching. Both of these artifacts seem to be from the time period of the lynching and so therefore could actually be artifacts from the event. On Mother’s Day in 1941 the popular “We the People” radio program hosted a daughter whose claims about her parentage incited a debate among western history scholars and buffs which continued throughout the next decade and remains unsettled even today. Though none of the major figures involved in this controversy ever lived in Fort Collins, Colorado a set of artifacts upon which the proof of some of its most hotly debated points rests happened to land in our Museum. Most of them are still here. On the program, Mrs. Jean McCormick announced that she was the secret daughter of Calamity Jane and Wild Bill Hickok, and substantiated her claim with a marriage certificate, letters, and objects she claimed her parents had given her, such as a diary, a diamond brooch, a lock of hair, and a prayer book with an inscription by Calamity Jane. Of these artifacts, the diary was especially unusual. It was an empty, old-fashioned photo album with entries addressing “Dear Janie” handwritten across its pages. McCormick claimed that this volume had been written by her mother over twenty-five years while she traveled and worked around the West. It included an account of a secret frontier marriage between Jane and Wild Bill; and of the birth of their daughter, Jean McCormick herself, in an isolated cabin in the heart of Yellowstone country. McCormick’s radio revelations made her an instant celebrity. In June she was invited to participate in the “Wild Bill Frontier Celebration” in Abilene, Kansas, where she rode in the parade as the buckskin-clad daughter of Hickok and Calamity Jane. Throughout the summer McCormick attended many similar western celebrations and rodeos, and even traveled to La Crosse, Wisconsin to attend a Hickok family reunion. Not everyone embraced Jean McCormick as the legitimate daughter of these famous western figures. Many historians came to believe that she had composed the diary herself and was, in fact, continuing to add and edit pages. Others felt McCormick was not clever enough to pull off such a hoax. Still others trusted her sincerity and embraced her as a legendary figure of the West in her own right. The Board President of what was then known as Fort Collins’ Pioneer Museum, Carl Anderson, was among the historians who trusted McCormick’s story. He apparently contacted her, and eventually she entrusted her family relics to the care of the Museum. “Mrs. McCormick chose our museum as a fitting place to exhibit relics of her father and mother,” Anderson later explained, “it being dedicated to the preservation of the history and traditions of the Old West.” Anderson published a series of articles about the intriguing life of Calamity Jane using excerpts from the diary and, despite protests from the many who doubted their authenticity, the other objects became popular components of the Pioneer Museum exhibit. 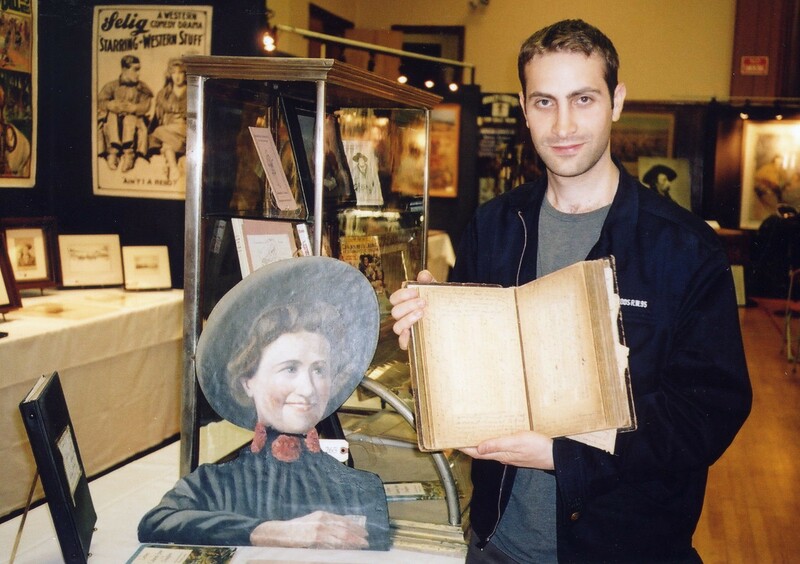 In 1951 Jean McCormick contacted the Museum by letter, abashedly requesting the return of a few of the objects: “I have a chance to sell Calamity Jane’s diary and the other articles I shall name… I have sold every thing I possessed just to live. I am sure you will be kind enough to do this for me.” Museum records document the return of four objects to McCormick in response: a diamond brooch, a sugar and creamer set, a leather case of Hickok’s, and Calamity Jane’s diary. Less than two years after writing this letter, Jean McCormick died in poverty. The diary she had retrieved from our Fort Collins museum resided, it seems, for some time in a museum in Billings, Montana. Recently, the diary was offered for sale on the international market. Blog back in next week for the continuing story of this intriguing woman and the artifacts that have helped preserve her story. With all the talk in the news about the economic crisis, stimulus proposals, and plans to create more jobs, I can’t help but be reminded of a similar situation that happened sixty years ago: The Great Depression and the creation of the Works Progress (later Projects) Administration, or WPA. The WPA was a New Deal program that focused on providing jobs for the unemployed by funding a variety of public projects, including constructing buildings and roads and funding the arts. From 1936-1939, almost $7 billion was spent on WPA projects, and almost 8 million jobs were created. The WPA continued until 1943 when the onset of WWII provided employment in war production. The Fort Collins Museum has special ties to the WPA: through it, $18,881 was allocated to help fund the construction of our precursor, the Pioneer Museum, which stood at the east end of Library Park from 1941-1977. Back then the Carnegie Library (the current home of the Fort Collins Museum) was located on the west end of Library Park, so the current locations of the museum and library are opposite of where they started out. In 1976 a new library was built in a U-shape around the Pioneer Museum, the Carnegie Library was turned into the Fort Collins Museum, and in 1977 the Pioneer Museum was demolished (apparently it had to be done in that order because the books from the old library had to be moved into the new library before the artifacts from the old museum could go into the new museum, which had been the old library). The sandstone lintel inscribed with “PIONEER MUSEUM” over the door of the Pioneer Museum was supposed to be saved and moved to the new museum, but the “PIONEER” part was shattered during the demolition. “MUSEUM” and the corner stone inscribed “Works Projects Administration 1940,” were saved and can still be seen in the planter in front of the museum’s west steps. Neat side story: the wedding suit of the man who cut and hauled the stone the cornerstone was shaped from was just donated to the Museum’s collections. Other WPA projects in Fort Collins include the City Park Nine Golf Course and the Municipal Power Plant on North College Avenue. Both the plant’s retaining wall along the south bank of the Cache la Poudre River and the fountain on its grounds were WPA projects that are now local historic landmarks. You can read more about the fountain at the “Lost Fort Collins” blog.